Berlin Eastside reached its second Women`s European Champions League title in superb style, defeating Fenerbahce 3:0 in Istanbul`s Ulker Sports Arena in returning game of the 2013/14 final. German side won first leg 3:2, so absolutely deserved the crown of this prestigious competition. It was a great accomplishment of Irina PALINA`s team and this season could be the best ever in Berlin`s history. They already have two trophies (German Cup and WECL) while in the national championships are still unbeaten. Fenerbahce was considered as main candidate for the crown prior the season, starting as no 1. seed. Turkish champion has all three line-up players among Top 30 on ITTF World ranking list, much better ranked then Berlin`s girls. But, PALINA`s players have been mentally stronger for these clashes and, no doubt, experience from previous WECL seasons had its role. Fenerbahce took ETTU Cup last year, but it debuted in main club`s league this season. Georgina POTA (world`s no. 35) opened the door of Berlin`s success, defeating HU Melek (no. 28) in four games of first clash. 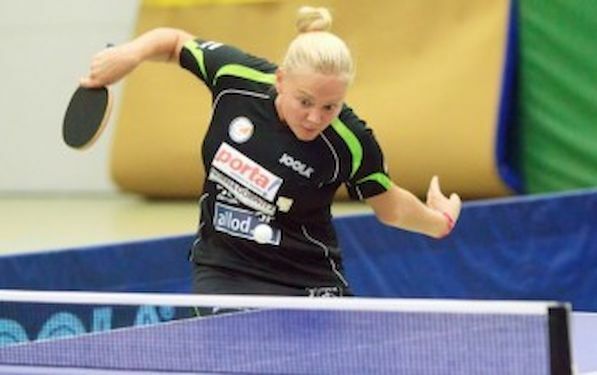 Hungarian was stabile during the game, while host made too many mistakes with her backhand. Third set determined the whole match. HU led 7:4 and had two set balls (11:10, 12:11), but she missed it. Fourth set showed that HU was fully affected by epilogue of third set. Two best players from both sides met in second encounter, as 2013 ECH individual runner-up SHAN Xioana (world`s no. 19) overcame twice single European champion (2010, 2012) Viktoria PAVLOVICH (no. 11) in four sets. Byelorussian women easily won opening set, having even 4:0 lead in second, but from that moment SHAN dominated. In late second set both missed some set balls, while in third guest was unstoppable. CHENG I-Ching (world`s no 30) was the last hope of Turkish champion, but 2011 European Championship silver medalist Irene IVANCAN (no. 46) beat her in five games, to secure the title for Berlin. It showed again that CHENG had a problem with defenders, and above all IVANCAN played excellent. The fifth set was fully amazing, with the longest point on 14:14, which belonged to host. That rally, with more than 30 changes, won CHENG, but guest took next three points in a row. Berlin Eastside became fourth club with two WECL titles in the history, after Sterilgarda (Italy), Heerlen (Netherlands) and Linz (Austria). In Cup of Champions era several German clubs took European title, but just Berlin did it twice since establishing of WECL.